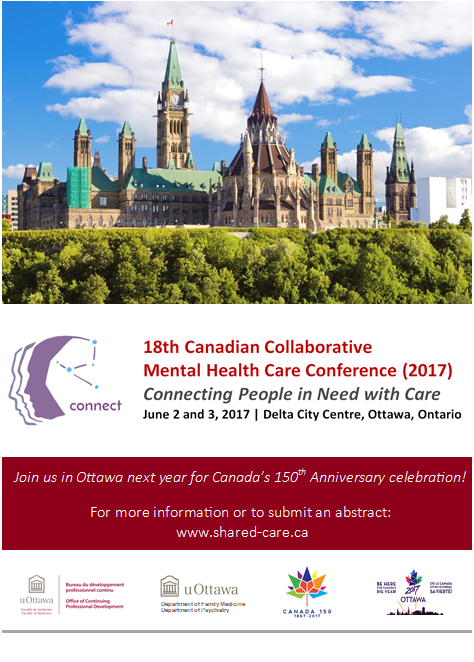 We are excited to welcome health care providers, administrators, policymakers, patients, and families to join us from June 2-3, 2017 at the Delta City Centre in beautiful Ottawa! This year we celebrate “Connecting People in Need with Care” as an overarching theme; connecting with patients of all ages and hard to serve populations, connecting via technology, connecting with policy makers to initiate change, and connecting with each other to work collaboratively in mental health care. Our host city for this year is also home to Canada’s 150th Anniversary Celebrations which will be taking place throughout 2017. This is the perfect opportunity to visit Canada’s capital and take part in this special year of National celebration (#Ottawa2017). Visit our website www.shared-care.ca as we continue to add more details.